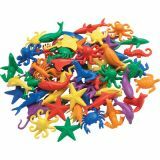 These animal counters are the perfect size for all sorts of counting and sorting activities and easy manipulation by little fingers. 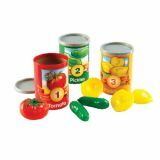 Super sorting tray includes four removable storage compartments and a snap-tight lid. 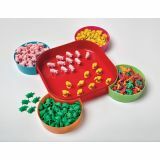 300 pieces include 50 pink pigs, 50 yellow chicks, 100 green turtles, and 100 frogs in four colors (25 of each color). 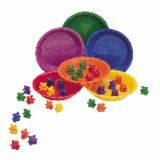 Colorful counters are perfect for all of your counting and sorting activities. 14 shapes in 6 different colors. Set of 84. Penguin measures 2" tall. Momma and baby birds help young learners practice counting, sorting and colors in an interactive and engaging way. The bowls stack, and the momma birds can be used as finger puppets. 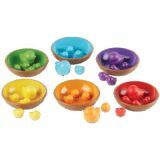 Little learners will love matching birds and nests by color. This deluxe set comes with over 30 fun pieces! Nests measure 4”L x 1”H; birds measure 1"H (baby) and 1¾”H (momma). 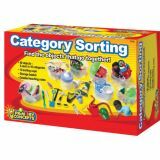 Children build classification, language, and thinking skills as they sort these 50 realistic objects into 10 categories: animals, people, toys, food, things to wear, baby items, vehicles, tools, musical instruments, and eating utensils. 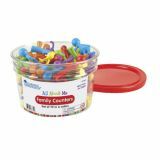 Includes sorting tubs, sturdy plastic basket, detailed Teaching Notes, and storage containers. 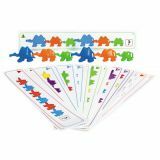 Using the Connecting Camels Set (CTU9650 sold separately), kids learn about sequencing and patterns with this set of 20 laminated activity cards. Includes teacher's notes with suggested extension activities. 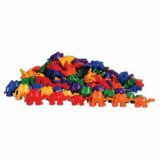 Little ones explore counting and sorting, shape and space, pre-algebra, measurement, data and more with this set of 96 plastic camels in 3 sizes, 3 weights (5g, 10g, 15g) and 6 colors. 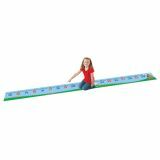 Promotes size recognition, estimation and mental math recall. Cyclic patterns, perimeters and measuring can be explored by connecting camels together. Packaged in a heat-sealed polybag. Our classic counting kits invite children to count these charming objects, learn one-to-one correspondence, and a whole lot more. Students record their work with See-Thru™ Object Stamps in their own I Can Read Numbers minibooks. 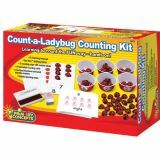 Kit includes 75 Ladybug counters, matching See-Thru™ Stamp, counting tubs with labels, laminated counting cards, and I Can Read Numbers Minibook Masters, plus Teaching Notes. Our classic counting kits invite children to count these charming objects, learn one-to-one correspondence, and a whole lot more. Students record their work with See-Thru™ Object Stamps in their own I Can Read Numbers minibooks. 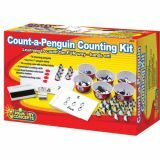 Kit includes 75 Penguin counters, matching See-Thru™ Stamp, counting tubs with labels, laminated counting cards, and I Can Read Numbers Minibook Masters, plus Teaching Notes.